I’m often asked if the Feingold Diet is worth it, in which I of course reply, “Yes!” I wrote a post on this a few weeks ago. See link below. Is the Feingold Diet Worth It? Someone recently asked me this and I suggested she do a 3-day trial of the diet (stage 1) to see for herself if it’s really worth it. As we like to say on the Feingold board, the proof is in the pudding. Now, not everyone will see results in just 3 days, but we did. 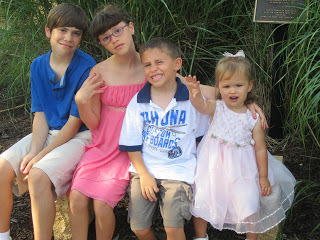 My son was 4 ½ at the time. The younger they are, the quicker you will see results. I have my shopping lists posted, but I do not list if the items are stage 1 or stage 2. I recently started another blog, www.feingoldrecipes.blogspot.com where I am listing at the bottom of each recipe if it is stage 1 or stage 2. It will take me a few weeks to get all of my recipes up, but I’ll try to go through and post the stage 1 recipes first. Check back soon for new recipes or become a follower or subscribe to have the new posts sent to your e-mail. Stage 1 is where you begin the diet. You eliminate certain fruits, spices, and other foods for the first 6 weeks. This gives you a basis to work with. You find out what your child is like without all the chemicals, artificials, and salycilates (sals). You likely have no idea at this point. Then, you can add back in stage 2 items, one at a time (once every 4 days), to see if they react to them. It’s not uncommon for kids to stay on mostly stage 1. We do for my younger kids, but it’s common for kids to become more tolerant of stage 2 foods the longer they are on the diet, and as they get older. Right now, these kids are reacting to everything. I believe that if their immune system weren’t fighting off so many foreign invaders (that’s what all these chemicals are – they’re not real food and the body doesn’t recognize them as food so they cause behavioral issues), they would be able to tolerate more real foods, like these fruits. That’s my opinion any way. I think the biggest thing that trips up parents in trying to do the diet on their own is that they don’t remove salycilates. Most parents think they are feeding their kids well because they are feeding them fruit, and I was one of them. But, those are salycilates, and they can cause some real issues in little ones. I did a post on salycilates as well last year. See link below. The common ones are apples (what kid doesn’t like apple juice? ), grapes, berries, tomato products (Ouch! This is the hardest one to avoid personally), raisins, dates, oranges, peaches, plums, cucumbers, chili powder, paprika, etc. The other thing that many well-intentioned parents do is to try follow the diet “most of the time.” If your child is eating one food item that has artificials, salycilates, or preservatives, that will affect them typically for about 2-3 days on average. So, if 90% of the foods they eat are clean, the other 10% is still going to cause a reaction. Now, I’m not saying just let your kids eat whatever then if you are not able to do the diet 100% for whatever reason. 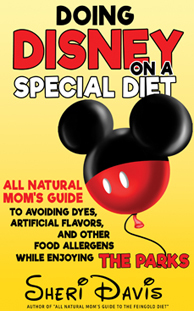 I do think it’s much better to try to keep your child’s diet as clean as possible. But, what I’m saying is, you may not be seeing the results you might see if you were to do the diet 100% and fully understand how the diet works. But, to get to the point, I’m going to put together a menu plan for 3 days with suggestions on meals, drinks, snacks, desserts…anything that goes into your child’s mouth. If you want to try the diet out, or are just curious to see what it looks like to do Feingold Stage 1, here’s your chance. Like I said, if you don’t see results, it doesn’t mean that the diet isn’t going to work for your child. It may just take a little longer for your child to get all the chemicals out of their body. I had cut way back for a few weeks before officially starting the diet, as we had to wait 2 weeks to get the materials from Feingold. But, this is what the diet might look like for a typical chicken nugget, mac-n-cheese loving American kid today. I used the likes of a 3-year old boy to put this meal plan together, but I think it will appeal to many kids. If your child doesn’t like something here, look through my stage 1 recipes and see what your child might like. One word of caution though. If you really want to see if this diet works, you do need to follow the meal plan/brand suggestions exactly. There’s no one bite of something with red dye. One bite could set your child off for 2-3 days. That’s how strong these chemicals are, which is pretty scary to me. Once you start the diet and become a member, don’t beat yourself up if you go off diet, whether intentionally or unintentionally. It’s going to happen. There’s definitely a learning curve. You have to figure out which foods and recipes your kids like and which stores have the products you need (and what aisle they’re in!). It takes time to get everything in place, but once you figure it out, it becomes second nature, and it’s not a big deal at all. You won’t take nearly as long at the store, and if you like to cook, you’ll have your freezer stocked with some homemade foods your kids like too. And if you can’t cook, don’t worry! Neither could I! That’s probably what got us into this mess in the first place! My sister used to love to tease me and ask my husband, “What’s for dinner? Mac-n-cheese or Spaghettios?” Guess who laughs now when her daughter comes over and boasts about all the yummy food she ate at our house and asks her mom to make it for her. J If you can read, you can cook. The person I made this meal plan up for has a Whole Foods and a Trader Joe’s near her, which is extremely helpful! Whole Foods is Feingold heaven. If you don’t have a WF, you can likely find some of the items at your local health food store (HFS), or they might be able to order some things for you. I had my HFS order me Rudi’s bread so I wouldn’t have to drive all the way out to Whole Foods when I needed it. I did have to buy a case (8 loaves), but I just put them in my freezer. Otherwise, most regular grocery stores are starting to have sections for organic or healthier food choices. If all else fails, you’ll have to make some things from scratch or order some things online (Amazon is good for that). If you have a mom or grandma who likes to cook, give her some recipes and ingredients and get her cooking! It’s nice to get them involved, because then they will hopefully support your efforts instead of trying to sabotage them. J It happens. So, below are some suggestions. Feel free to mix up the days and meals to whatever works best for you. This may or may not work for your family, but I tried to list foods that most kids like. The guidebook lists many brands. I listed what we use or some of the more popular ones. If you choose to join Feingold, you will have a lot more choices available to you through the shopping guide. Note: I would avoid corn syrup personally. It’s evil. It’s listed under the approved foods in the shopping guide, but they do list if it contains corn syrup for those who wish to avoid it. Many do. When eating out however, it’s almost unavoidable and it’s one of those “lesser evils” we just deal with and only eat on occasion. The basics: First off, below are some of the basics for cooking. Butter: We use Land O’Lakes or Horizon Organic butter but most are OK as long as the ingredients are just mainly cream and salt, etc. Milk: It used to be that all whole milks were approved, but recently they’ve found preservatives (BHT) in these as well. So, if you do milk, here are a few of your choices: 365 brand (from Whole Foods), Horizon Organic, Market Pantry, Organic Valley, Prairie Farms, or Oberweis (only Low Fat or Nonfat). For dairy free milks, we use Pacific Rice Milk or So Delicious Coconut Milk. Rice Dream is also approved but not truly gluten free. Eggs: Any fresh eggs are fine. I prefer organic personally. Cheese slices: Land O’Lakes White American (in the deli – have them slice it) or Sliced Medium Yellow Cheddar, Tillamook (This is a block of cheese. I’d take it to the deli and have them slice it, or I sliced it at home. If you can’t find it, ask your deli person. Sometimes it’s in a refrigerated section apart from the regular cheeses), or Horizon Organic American Singles Pasteurized Process Cheese Food, or Wholesome Valley Organic American Cheese. Shredded Cheese: Some options are 365 brand (Whole Foods-looks like all of their shredded cheeses are OK), Sargento 4 Cheese Mexican Blend, Horizon Organic Monterey Jack or Mozzarella shredded cheese, and Tillamook cheeses. Bread: We use Rudi’s Honey Sweet Whole Wheat from Whole Foods. Food For Life has a 100% Whole Wheat Bread. Natural Ovens Bakery has a few approved brands like Right Wheat Bread or 100% Whole Grain Bread. Most of their other breads have corn syrup.Update: King’s Hawaiian sandwich bread, Hawaiian sweet rolls, hamburger and hot dog buns are now approved and is what we use now. I can find them at Wal-Mart, Meijers, Woodman’s. Some people make their own bread. I can see why. There are very few breads that do not have preservatives, and many have corn syrup as well. “Elaine’s Sandwich Bread” is a homemade bread recipe that is popular with Feingolders. If you have a bread machine, go crazy. I really need to try to make this. Rudi’s is about $5 a loaf. Homemade is very cheap. For gluten free, we use Food for Life Brown Rice bread. It’s stage 2 though. I don’t even see it listed in the Feingold shopping guide. Not sure what’s up with that. Their other breads are listed. We also use Breads by Anna bread mixes.Update: We now also use Rudi’s Gluten free bread. It does contain eggs though. Rice: Any basic white or brown rice is OK. I prefer organic b/c of the arsenic added to regular rice, or else we use Uncle Ben’s 5-Minute Rice. Flour: Any flour is fine. I prefer King Arthur Unbleached though as it is less processed and hasn’t been bleached. White Sugar: Any white cane sugar is approved (some sugars are made from beets). I like C&H brand, but we use a big bag of Wholesome Sweetener Organic from Costco. Powdered sugar: I use organic, but you can use C&H or Domino. Brown sugar: Domino or organic. Vanilla: The McCormick vanilla contains corn syrup. If you want to avoid corn syrup (I highly suggest it), look for one without corn syrup. Most organics will not have corn syrup. Costco used to have one that was gluten free and corn syrup free. I used to make my own vanilla, but there is currently a vanilla bean shortage and I can’t get any vanilla beans from where I usually order them. Fruit: Banana (medium salycilate – don’t want to give them these every day), grapefruit, pear, kiwi, pineapple (can use Dole canned pineapple – check for corn syrup), honeydew, cantaloupe, or watermelon. Scrambled eggs or omelet with butter for greasing, and topped with Hormel Natural Choice ham (slices in brown boxes – I just shred into pieces) and shredded cheese. Or make a hard-boiled egg. Bacon (Hormel Natural Choice – Original, or Oscar Mayer). Can add the bacon to the eggs as well if you’d like, or save some for baked potatoes later. You can make the bacon at any time if you don’t have time to cook in the morning, and then store it in the fridge. 8/1/15 Update: All Hormel deli meats recently added cherry powder so they are now stage two instead of stage one. Toast with butter or peanut butter, or butter and garlic powder, or butter and cinnamon. (Most jellies will be stage 2). Macaroni and Cheese – Annie’s Homegrown (Lots to choose from. We like the shells with the cheese sauce that you just add to it. Or we do the microwavable ones for vacations.) Trader Joe’s has Macaroni and White Cheddar Cheese Classic. Whole Foods has a 365 brand but only the Organic contains no corn syrup. Simply Organic also has a mac-n-cheese. If you are GFCF, we like Amy’s GFCF and soy free microwavable meal. Veggies: Carrots and celery with peanut butter (JIF or Skippy) or Marie’s Creamy Ranch Dressing, or Philadelphia Cream Cheese and pineapple juice for dipping. My kids like this in Zoo Pals plates. Or veggie of your choice: Green beans, cooked carrots, peas, broccoli, cauliflower, corn, asparagus, etc. Garlic Lime Chicken and rice. We use Lundberg Organic white rice or Uncle Ben’s 5-minute white rice. For stage 1, you’ll have to omit the paprika and cayenne pepper in the recipe. I have a note on the bottom of the recipe. I make this one a lot. We have the leftovers for breakfast. Cereal – many cereals contain preservatives (BHA or BHT). This may or may not be listed in the ingredients on the box. They spray the packaging with the preservatives and it gets into the food. There are a lot of cereals to choose from, but the only mainstream one we eat is Kellogg’s Crispix (there are very few mainstream ones to choose from). Our other favorites are Trader Joe’s Toasted Oat Cereal (like Cheerios for the toddler in your home). The Honey Nut O’s are really good too but are stage 2. Whole Foods’ 365 Brand has some approved stage 1 cereals, but some have corn syrup. Other brands are Annie’s, Erewhon (like rice krispies), Barbara’s Bakery, Kashi, and Envirokids. We eat the following: Erewhon rice krispies, Envirokids Frosted Flakes, Gorilla Munch (like Kix), and Crispix. Before we were peanut free, we also ate the peanut butter and chocolate and Panda Puffs. When staying stage 1, most of the cereals are going to be things like shredded wheat, oats, peanut butter, chocolate, cinnamon, corn flakes, corn puffs, rice krispies, etc. Nothing fruity. Sandwiches – Rudi’s bread (or make rolls with fancy toothpicks) with Hormel Natural Choice deli meats – roast beef, turkey, ham, or carved chicken breast. Can use Hellmann’s Mayonnaise or Kraft Miracle Whip (original, not reduced fat). French’s mustard is stage 2 because of apple cider vinegar used in it. Stage 1 mustard is French’s Zesty Deli Brown Mustard or Organicville’s Stone Ground Mustard. Lettuce is fine. Or, they can have peanut butter sandwiches (or PB and bananas) with JIF Creamy peanut butter. Smucker’s Peanut Butter is also approved. Grilled cheese sandwiches with approved cheese. Oscar Mayer summer sausage is approved (double check this. Some were recently removed). Could put some sausage on crackers – we use the 365 brand Golden Rounds, or there’s Barbara’s Bakery Rite Lite Rounds, original flavor, Late July Organic Classic Rich. If I have some Tillamook cheese, I cut off little cubes or slices to go with it. Annie’s has a whole line of kid friendly crackers. Soup – Trader Joe’s Chicken Noodle Soup or 365 Organic Garlic Chicken Soup. Imagine has a few choices but probably not ones that most kids would like. There’s a broccoli soup, butternut squash, potato leek, mushroom, etc. Tomato soup is stage 2. Plain noodles and butter. Spaghetti sauce is going to be stage 2 unfortunately. But, if your child likes noodles and butter, most noodles are approved. My son used to eat No Yolk Egg Noodles with butter, or 365 has some egg noodles, or any regular pasta noodles. The ingredients should just be the basics like flour, durum, wheat semolina, etc. Pancakes or Waffles – We use Aunt Jemima’s Original Pancake Mix (not “Complete” where you just add water). You can make these whenever and then store them in the fridge for a couple days, or in the freezer for a couple months (if they last that long). I make a double or triple batch and store in the freezer. I’m not a morning person. J Or you could make some french toast. I freeze these too. For syrup, you’re going to have to ditch the Mrs. Buttersworth. It’s basically all corn syrup, artificial flavor, and preservatives. You can use any pure maple syrup, but it’s expensive. You can make your own syrup out of sugars. Or you can combine half maple syrup and half homemade syrup too. Or, you can use Agave syrup. We use Wholesome Sweeteners brand from Costco. The jury’s out on whether agave is “healthy” or not. It is Feingold approved, but people argue about whether it is any better than corn syrup. It’s used in many health foods and health conscious cookbooks, but it may be heavily processed. We do use it but I’m thinking of switching back to maple syrup and homemade just in case. I like the syrup from Cracker Barrel too. It’s about $5 for a small bottle. I guess it’s comparable to maple syrup which is crazy expensive. Many times my son doesn’t even use syrup. He tops with whip cream (We use Natural by Nature from Whole Foods or the health food store. This isn’t listed in the shopping guide but it seems OK for us), some Ghiradelli chocolate chips, and sometimes butter. For waffles, I have a Mickey Mouse waffle iron that makes waffles in the shape of Mickey’s head. These go over well. Just follow the directions on the box to make waffles. Chicken Nuggets. I have three recipes for chicken nuggets. They’re all good but the Frito Chicken Tenders are my favorite, and they’re easy to make. My kids are strange when it comes to chicken nuggets. Each of them has their favorite chicken nugget recipe so I make all of them and just freeze them with their names on it. If you don’t want to make chicken nuggets, Whole Foods has some that are approved. Sam’s and Wal-Mart has some Dino nuggets that are approved but they do contain corn syrup if you want to avoid corn syrup. We like the Ian’s GFCF chicken nuggets and patties. They have a corn breading. These might take some getting used to though because they are not like the chicken nuggets kids are used to. Ian’s makes a microwavable chicken nugget meal that is not GFCF that my son likes. We also eat the GFCF one. The two taste very similar. If your kids absolutely won’t eat chicken nuggets without ketchup, I say let them have it. I know it’s not allowed in stage 1 but it’s so darn hard to avoid. So, that one’s up to you. I know die hard Feingolders will flame me for that one, but I say, just watch your kids for a reaction, and if it’s obviously a trigger for them, then pull it. My kids seem to be OK with small amounts. I think all these chicken nugget recipes taste good without ketchup though. For a side, you can do some kind of potato – baked potato, seasoned red potatoes, potato wedges, mashed potatoes, etc. They have some 365 tater tots that are approved but they recently added apple juice to them, so now they are stage 2. Bummer. Add a veggie to the meal too if you’d like. Steak or hamburgers with Rudi’s or King’s Hawaiian buns. Again, ketchup is stage 2 (we use Hunt’s with no added corn syrup), as is mustard, unless you use one of the few approved mustards that you can only find at Whole Foods. If that eliminates hamburgers for you, there are a few other recipes that are options. A pot roast or beef stew in the crockpot, honey lime chicken and rice, lemon mustard chicken and rice. We do a lot of chicken and rice because we are GFCF too, but I try to mix it up with beef or pasta during the week too. If you can do dairy, that will open up some more meals for you. Browse through cookbooks at your library or online for recipes that your family might like, and then make them using approved ingredients. Desserts: We usually only do desserts for parties and such, but I did use desserts in the beginning as a reward for trying new foods. If you have a birthday party coming up, bring one of these desserts along. Peanut butter cookies, puppy chow, homemade cupcakes or cake, Haagan Dazs vanilla ice cream is approved (pricey), or 365 brand from Whole Foods is approved, and a few others. Trader Joe’s has one.Keebler waffle cones or Whole Foods has a couple regular sugar cones that are approved. We use the gluten free ones. They taste the same as regular cones. Smucker’s Magic Shell is approved – chocolate or chocolate fudge. Snacks: Lay’s potato chips, Ruffles, Tostitos, Fritos, (the Frito Lay company has stopped filling out forms so you won’t find these in the shopping guide anymore but they used to be approved, so use at your own discretion. They seem to be OK for most members though. ), Trader Joe’s Cheese Curls or Puffs (like Cheetos), Trader Joe’s organic mini pretzels, 365 organic pretzels, cashews, sunflower seeds, Angie’s Kettlecorn Popcorn (these aren’t in the shopping guide but I’m thinking it’s because they are newer), Pretzel Crisps (Costco or any store), Annie’s pretzels (no MSG in these), Nabisco Original Premium Saltine crackers, homemade muffins, etc. Check my shopping lists for more suggestions. Drinks: Water is the best thing for your kids to drink but not always doable. We drink Simply Lemonade, Simply Mango Lemonade, or homemade lemonade. Florida’s Natural Grapefruit juice is approved. You can use Gerber Pear Juice as a sub for apple juice. I had to remove the apple juice for a few weeks first before introducing pear juice. Younger kids may not notice the difference but older ones will. With any food, after they’ve not had it for a while, they are much more open to trying the new slightly different food (or drink). I guess it’s better than nothing. We did that with dairy ice cream. Dairy free ice cream tasted better than no ice cream at all. My kids can’t do milk. We use So Delicious Coconut Milk or Pacific Rice Milk. Many kids like chocolate milk. I noticed that my kids get aggressive and emotional (whiny/crying/hitting) every time they have chocolate so we try to stay away from it. It also adds a lot of sugar. I personally would stay away from chocolate, or limit it during the 3-day trial, just in case. But, there are some natural chocolate syrups at Whole Foods or the health food store that you could add to milk, or use Hershey’s cocoa powder. Google a recipe to use to make chocolate milk with Hershey’s. We use it to make hot chocolate at Christmas time. Sierra Mist Natural is approved (I believe. It’s not in the guide book but many members use it.) but has lots of sugar. We only drink it on special occasions and my kids usually split a can. The regular Sierra Mist contains corn syrup. Coke and Sprite are approved, but contain high fructose corn syrup. However, I don’t recommend giving pop to your kids. If you really want to wow your kids, and you are not new to the kitchen, you can make them some Auntie Annie’s soft pretzels or Cinnabon cinnamon rolls. Yum! Bummer that we are now GFCF because these are too good to make in a house with gluten free kiddies. That would just be torture for them. But, I used to make these a lot and then freeze them. My older son has been bugging me to make these again. I think I’ll get Grandma to make them for him. If you don’t get them right on the first try, don’t worry! I never do. It usually takes me about three attempts at any new recipe to get it just right. It’s a learning process. I also just got some really cool Wilson doughnut pans from Meijer. They are in the shape of Long John donuts. I also have some circle donut pans and mini donut molds as well. I’ve made GFCF donuts with them. I haven’t made regular donuts yet, but I need to soon. I’ll post the recipe when I do. There are several out there on the web including a Krispy Kreme copycat recipe I just saw on Pinterest the other day. Making donuts in the oven with these molds is as easy as making homemade cupcakes. Not hard at all. I like that they’re not fried too. So, there you have it. I know this may seem overwhelming and a lot of information to take in. If you join Feingold, they will send you a lot more information that explains and answers all your questions that you may have lingering. I know this may have sparked more questions for you. Sorry if I’ve left you hanging. If you notice improvements in your child during this 3-day trial, I think it’s safe to say that the $82.50 (now $69 or $89) will be worth it. You’ll drive yourself crazy trying to do the diet on your own. This is just a suggested meal plan for 3 days, not for every day. It’s also possible that I’ve listed an item that may not be approved anymore or I just listed it wrong. If so, I apologize. But, this will give you an idea of how we do Feingold stage 1. 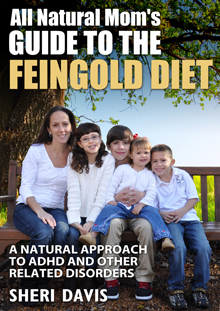 If you are new to Feingold, this might help you get started. 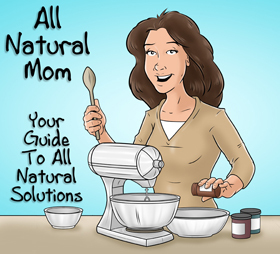 You can also follow me on Facebook now – All Natural Mom. There’s a link on the home page of my blog. I’ve been posting some of our meals, along with some tips here and there on how we do the diet practically speaking. 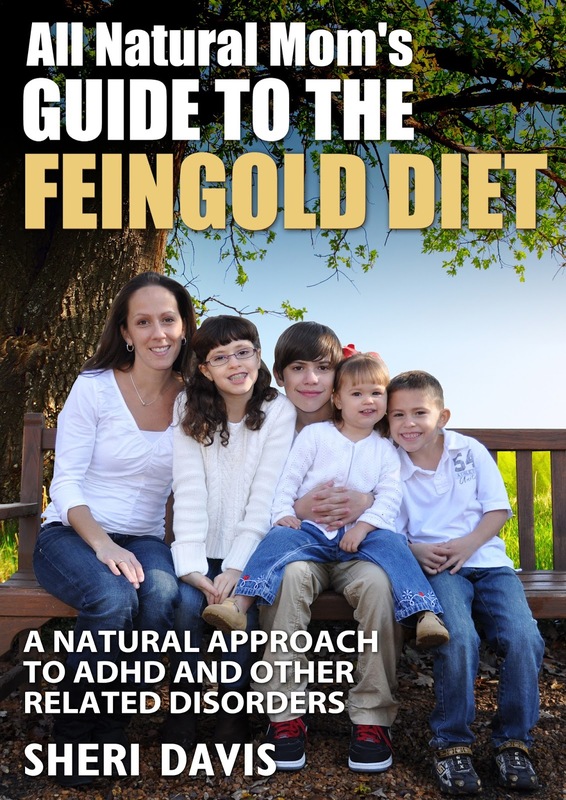 To learn more about the Feingold Diet, check out my book “All Natural Mom’s Guide to the Feingold Diet – A Natural Approach to ADHD and Other Related Disorders” available now on Amazon! I so appreciate you putting this three day trial on here and I am excited (nervous) to start. I do have a question, though. Do we need to be using dye-free toothpaste and other things during this time in order to see a more complete picture of how this is affecting our children? Thank you!! It would probably help. We use Tom's of Maine Silly Strawberry. It's stage 2 but my kids don't like the minty stuff. It's at most grocery stores now I believe. Also, they just removed the Breyers vanilla ice cream from the shopping guide. 🙁 I need to update that on this post. Good luck. Do you use a special shampoo as well since many shampoos contain fragrances and other harmful chemicals? Yes, we have used Desert Essence Unscented before. I order it online b/c it's much cheaper than at Whole Foods ($8.99). The Vitamin Shoppe has it slightly less but I get it from http://www.vitacost.com usually for about $5. We use the shampoo, conditioner and body wash. It's fine for boys but for my daughter who has thick curly hair, we just switched to Mineral Fusion Curl Care ($6.99 on Vitacost). It works much better. They don't have an unscented but the Curl Care has the least amount of smell to it. The others have an stronger orange smell which bothers me. The Desert Essence left dry, knotty hair. Feingold has very few to choose from for shampoos. I think they just haven't researched them. The ones we use have no gluten, allergens, no parabens, and they say no artificial scents, colors, etc. so I think they are fine. Hope that helps. Thank you so much for this post! I want to put my 4 year on a trial run and his favorite thing to eat is pb and honey sandwiches. Is honey approved for stage 1? Hi Lisa. Yes, honey is stage 1. They say some very sensitive people may have a problem with honey made from salicylate plants like orange blossoms. It usually says on the bottle what the honey was made from. Hi April. The sal list on the Internet is slightly different than Feingold's. Actually if you look at different sources, even on the Internet they vary slightly. The list I made for the 3-day trial is based on Feingold's list of stage one fruits. 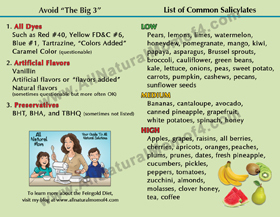 Most are true low salicylate fruits, but there are a few that are ones that Dr. Feingold found were not a problem for his patients, and Feingold members so they are considered stage one. Some are medium salicylates but allowed on stage one, in moderation (not every day). As well, each child is different, so you just need to see how your individual child reacts to it. Hope that helps. Also, fresh pineapple is considered high sal on FG, but canned pineapple is considered low. Hi. Yes, GF bread is expensive. I have not attempted to make my own. I have made the Breads by Anna bread mix which is really good but also very expensive. More expensive than Rudi's. So I can't vouch for a GF bread recipe but you can google some and try them out. Good luck to you! Is 3 days really enough time to detect a difference? I've just started this diet to help my kids. Can you tell me if natamycin, a natural mold inhibitor, is allowed or not? Thanks for your help. is it worth it to sign up for the Feingold Diet if I do not live in the US and cannot buy the listed products? how do I go about researching the products in my country?